Three-term New York City Mayor Michael R. Bloomberg is providing initial funding for a new international policy center at the Johns Hopkins University named in honor of his long-time friend, former Secretary of State Henry Kissinger. The new Henry A. Kissinger Center for Global Affairs will be located at the university’s Paul H. Nitze School of Advanced International Studies in Washington, D.C. It will specialize in long-term strategic analysis and in the disciplined application of historical lessons to contemporary international problems. The center, which will include at least 10 distinguished scholars in international affairs, will also serve as a focal point for scholarship and public debate on international affairs and policy. The discussion will be led by the center’s resident and visiting scholars, intellectuals and policy practitioners. Bloomberg, a Johns Hopkins alumnus and former chairman of its board of trustees, is committing funds to establish the center. These funds will be matched by other donors and by Johns Hopkins, which also will dedicate two of its Bloomberg Distinguished Professorships to the Kissinger Center. In total, at least 10 new endowed chairs will be established at the center. 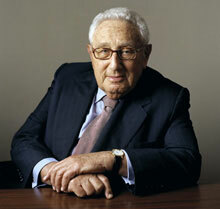 Kissinger served as national security adviser and secretary of state in the Nixon and Ford administrations. He negotiated nuclear weapons and anti-ballistic missile treaties with the Soviet Union and laid the groundwork for President Richard Nixon’s breakthrough visit to China in 1972. He negotiated for the United States at the Paris peace talks that led to the end of the Vietnam War. Vali Nasr, the dean of the School of Advanced International Studies, said he is particularly pleased that a valuable new scholarly center at SAIS will honor the former secretary of state. “The Kissinger Center is a timely investment in furthering the study of international relations during a period in which the global order faces both new opportunities and complex challenges,” Nasr said. A former Harvard University professor of government, Kissinger has remained an influential observer of international affairs. He is the author of 18 books and is founder and chairman of Kissinger Associates Inc., an international consulting firm. Kissinger has been awarded the Nobel Peace Prize, the Presidential Medal of Freedom and the Medal of Liberty. Gifts supporting the creation of the center are part of Rising to the Challenge: The Campaign for Johns Hopkins, an effort to raise $4.5 billion, primarily to support students, research and discovery, and interdisciplinary solutions to some of humanity’s most important problems. The campaign, supporting both the university and Johns Hopkins Medicine, began its quiet phase in January 2010, was publicly launched in May 2013 and is targeted for completion in 2017. More than $2.95 billion has been committed so far.